· Smarter Balanced Interim Assessments will be available. · The California Alternate Assessment (CAA) for Science embedded performance task (PT) training test that shows the new online format of this assessment will be available. · The Content of Assessment information for all the 2018–19 embedded PTs that are available in January 2019 will be available. 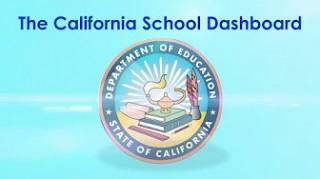 · The California Science Test (CAST) training tests will be updated. · The online CSA training test will be updated. · Smarter Balanced Summative Assessments for English language arts/literacy (ELA) and mathematics will be available. · The CAAs for ELA and mathematics and the CAA for Science field test will be available. · CAAs for ELA and mathematics and CAA for Science Directions for Administration (DFA) PDF documents will be available for download from the Test Operations Management System (TOMS). · The CAAs for English language arts/literacy (ELA) and mathematics practice tests will be updated. · The CSA practice test—one test per grades three through eight and high school—will be available. · The new CAST braille practice tests for each grade assessed will be available. · The CSA operational assessment will be available. · The CAST braille form will be available. · The CAA for Science 2019–20 embedded PTs will be available for administration. Questions regarding CAASPP should be directed to CalTAC by phone at 800-955-2954 or by email at . Editor's Note: We routinely repost messages from the CDE that are marked as "Please share with educators"
This month’s featured Digital Library resource, “Exploring Pi with ‘Sir Cumference,’” is a mathematics lesson intended for students in grade seven. It uses the fictional story Sir Cumference and the Dragon of Pi to introduce students to the relationship between the value of pi and the diameter and circumference of a circle. Emulating the mathematics work of the story’s medieval hero Sir Cumference, the students are challenged to complete circumference calculations by using data collected from real-world objects. This lesson provides a number of opportunities for students and teachers to engage in the formative assessment process. As students gather and share data, the included resources allow them to elicit and analyze evidence before adding it to the class’s data table. Over the course of the lesson, several opportunities arise for students to engage in discussion, analyze their progress, and make adjustments to meet the intended learning goals. The materials include an interactive PowerPoint presentation that both clarifies the intended learning goals and provides links to web resources that support instruction. “Exploring Pi with ‘Sir Cumference,’” contributed to the Smarter Balanced Digital Library (Digital Library account required) by California State Network of Educators member Sabrina Jordan-Ortega, is designed to span two instructional days. It offers an optional assessment teachers can use to measure progress and culminates with an optional computer-based quiz that provides immediate feedback, allowing students to demonstrate their understanding. The digital content can be downloaded and printed for classroom use. When will the California Department of Education (CDE) publicly report Initial ELPAC results? Initial ELPAC results will be reported on the CDE’s public reporting site after the end of the 2018–19 school year. Until that time, local educational agencies (LEAs) are required to report Initial ELPAC results to parents within 30 days of enrollment in a California public school. Locally, LEAs can provide educators with access to the official scores after they are generated in the Local Scoring Tool (LST) by uploading the results file into their student information system. Who inputs raw scores into the LST? LEAs have discretion in determining who inputs student raw scores into the LST. Your LEA is invited to participate in the California Spanish Assessment (CSA) field test from September 17 through October 12, 2018. The purpose of the CSA field test is to gather test response data from students representing diverse backgrounds and geographic locations throughout the state. This is an opportunity for your LEA to experience the assessment, which is designed to measure students’ Spanish skills in reading, writing mechanics, and listening. Once operational, the CSA will provide aggregate data that can be used for evaluating the implementation of Spanish language arts programs at the local level. The data may also provide a high school measure suitable for use, in part, for determining eligibility for the State Seal of Biliteracy. While any number of school sites and students are welcome to participate, there is an especially high need for participation of students in grade nine. If your LEA is interested in participating in the CSA field test, please contact Marques Barron, CSA Program Administrator, Educational Testing Service, by email at . - The Initial ELPAC administration window opened on July 1. - The Local Scoring Tool (LST) became available in the Test Operations and Management System (TOMS) on July 9. - The Initial ELPAC data file layout will be posted on the ELPAC Test Administration web page by July 13. - The Initial ELPAC preliminary score sheet and instructions as well as the conversion tables will be posted in TOMS by July 13. They are available for optional summer use by local educational agencies (LEAs) that choose to wait until fall to enter raw scores in the LST. "Understanding Your Student Score Report"—in English, Spanish, Mandarin, and Vietnamese—is now available on the ELPAC Resources web page of the ELPAC website. It provides parents and guardians with an explanation of their child's Summative ELPAC score report. In addition, LEAs are reminded that non-scorable Summative ELPAC materials must be returned to Educational Testing Service (ETS) as soon as possible. Non-scorable test materials are not to be shredded locally. If your LEA shredded the test materials, please submit an ELPAC Testing Irregularity and Security Breach Form, available on the ELPAC Test Administration web page, and email the form to ETS at . Please share this email with any educators in your local educational agency who would be interested in or benefit from this information. To join the email list, send a blank email message to . Are you a new subscriber? Visit the CDE Assessment Spotlight web page to find previous issues. During the preview period of the 2016–17 CAASPP public Web reporting site, some local educational agencies (LEAs) identified a small number of cases in which test results did not appear to aggregate as expected to their district or charter school summaries. The CDE delayed the release of the statewide test results in order to investigate these reported cases. The issue impacts only the CAASPP public Web reporting site and the research files available from that site for 2016–17. Please be assured that the individual student achievement levels and scale scores that have been reported to your LEA or direct funded charter school are correct. Once we complete our analysis and the new release date is finalized, the information will be provided to LEAs along with details and timeline for accessing the embargoed Web site. LEAs will have an opportunity, before the public release, to review the state, county, district, and/or school CAASPP reports once again to verify that the anticipated results are displayed and that all schools in the LEA are included. Reminder: CAASPP Online Systems Resume September 5! Questions regarding the 2017–18 CAASPP online systems should be directed to the California Technical Assistance Center by phone at 800-955-2954 or by e-mail at . Focusing on the California Assessment of Student Performance and Progress (CAASPP) System, including the Smarter Balanced assessments—a major component of CAASPP—and the California Alternate Assessments and science assessments. In addition, 10 existing policies have been updated for clarification or editorial changes. The updated UAAG, published on June 30, 2017, is available on the Smarter Balanced Accessibility and Accommodations Web page in the "What Are Accessibility Resources?" section. On another accessibility note, Matrix One is in the process of being updated for the coming administration. The matrix updates will reflect the UAAG changes. We are pleased to announce that the 2017 Spanish versions of the Student Score Reports for both Smarter Balanced Summative Assessments and the California Alternate Assessments are now available on the CDE CAASPP Student Score Report Information Web page. The 2017 version of the Guide to Understanding the Student Score Report is now available for both Smarter Balanced Summative Assessments and the California Alternate Assessments. These guides come in both English and Spanish, with other translations coming soon. These documents are organized by grade level and provide information about the assessments specific to each grade level. The English Language Proficiency Assessments for California (ELPAC) Update, from the California Department of Education (CDE), is an e-mail for K-12 educators, including testing coordinators, which focuses on the English Language Proficiency Assessments for California. When the ELPAC is operational, it will replace the California English Language Development Test (CELDT). The ELPAC Update will be sent once per month beginning March 2017. Please forward this e-mail to any educators in your local educational agency (LEA) who would be interested in or benefit from this information. The ELPAC draft regulations are located on the CDE ELPAC Regulations Web page. Be on the lookout on the CDE ELPAC Web page after October 1, when the approved regulations will be posted and ready for the first administration of the ELPAC in spring 2018. Are you interested in ELPAC resources for parents and educators? The CDE and Sacramento County Office of Education (SCOE) are developing an ELPAC flyer for parents, an ELPAC Fact Sheet, and ELPAC Domain Information sheets for educators. These resources are designed to provide the reader with valuable information about the ELPAC. Be on the lookout in August, when these resources will be posted on the ELPAC.org Web site. ELPAC Initial Assessment Field Test (FT): Coming Soon! With the ELPAC Summative Assessment having ended last April, we are now gearing up for this fall's ELPAC Initial Assessment (IA) FT. The CDE and its testing contractor, Educational Testing Service (ETS), are looking for LEAs interested in having several of their schools participate in the IA FT, which is scheduled for Monday, August 28, through Friday, September 22. The CDE and ETS are in the process of developing the ELPAC Student Score Report. In order to develop a student score report, one that effectively communicates a student's progress toward English language proficiency, educators and parents/guardians will be invited to provide their input on the format and content of the score report. Stay tuned for more information, coming soon—in the July issue of the ELPAC Update. Reminder: The online Superintendent's Designation of an LEA ELPAC Coordinator Form for the coming school year is due by August 1. This form was e-mailed to superintendents on March 1. After ETS has received the designation form, a confirmation e-mail will be sent to the newly designated LEA ELPAC Coordinator. The confirmation e-mail will prompt the new coordinator to fill out and submit the Test Security Agreement for LEA ELPAC Coordinators and ELPAC Site Coordinators Form, which will grant the coordinator access to the Test Operations Management System (TOMS). TOMS is the online system that coordinators will use to manage all aspects of ELPAC testing, including the assignment of user roles. After August 1, important communications from ETS will be sent directly to LEA ELPAC Coordinators. Take care of this detail now, and then rest assured that the appropriate staff in your LEA will receive important ELPAC-related communications from ETS without delay! To subscribe to the ELPAC Listserv, please send a blank e-mail to . On Tuesday, June 13, 2017, beginning at 8:30 a.m. and concluding at approximately 3:30 p.m., Educational Testing Service and WestEd, in partnership with the California Department of Education, will broadcast the 2016–17 California Assessment of Student Performance and Progress (CAASPP) Post-Test Workshop: Using Assessment Results to Inform Teaching and Learning live from the Post-Test Workshop at the Santa Clara County Office of Education. The purpose of the workshop is to inform local educational agencies (LEAs) of the various components of the 2016–17 CAASPP student results and reports for the Smarter Balanced Summative Assessments for English language arts/literacy (ELA) and mathematics and the California Alternate Assessments (CAAs) for ELA and mathematics, and how this information might be used to inform instruction. What do you need to know about these assessments? What resources are available to you and your team? Where and how can you access these resources? How can you use the results and resources to inform teaching and learning? How can you and your team optimize the results and the resources? You may view the Webcast on the CAASPP Webcast Web page on the CAASPP Portal. This Webcast does not require preregistration or a logon account. It is highly recommended that remote viewers participate in a local group setting as there will be 20–30 minute blocks of time where you are asked to work with others in your group. We encourage you to watch this Webcast with curriculum, professional development, and instructional leaders, as well as other LEA or site representatives who might be expected to disseminate the information to other educators within your LEA. PowerPoint presentations and handouts are available on the Training Videos and Webcasts Web page on the CAASPP Portal. If you would prefer to attend an in-person training, registration is still available at some locations. Visit the online registration form to see dates and availability. Questions about the Webcast and all other topics regarding the 2016–17 CAASPP administration should be directed to the California Technical Assistance Center by phone at 800-955-2954 or by e-mail at . Testing is in full swing with large volumes of online CAASPP testers—today's peak had over 450,000 students testing concurrently. The usage of the system is monitored, and when it gets close to its maximum concurrent users, it protects the system and those students who are testing by restricting access to new sessions. This situation occurred for about 20 minutes today. At that time, some test administrators received a system message and were able to log on after waiting approximately 10 minutes. In an abundance of caution to maintain smooth operations of the CAASPP assessments for your test administrators and students, the CAASPP practice and training tests will be unavailable from 8 a.m. through 11 a.m. PT on May 3, 4, and 5, 2017. At this time, we do not anticipate the need to take the interims offline this week but please note that we may modify that decision if volumes increase. I would like to emphasize that all CAASPP systems are running well. We are taking this step to ensure a positive testing experience for your test administrators and students. We are posting this information as a reminder on caaspp.org. The 2016–17 CAASPP summative assessments include: the Smarter Balanced Summative Assessments for English language arts/literacy (ELA) and mathematics; the California Science Test (CAST); and the California Alternate Assessments (CAAs) for ELA, mathematics, and science. If you have any questions about this e-mail, please contact the California Technical Assistance Center (CalTAC) by phone at 800-955-2954 or by e-mail at . Thank you for your continued support and patience. As an advocate for effective software systems and a participant in the study, I added my voice to the notion that the CDE should be looking much closer at existing 3rd party assessment systems. More than half of California's school districts have a 3rd party assessment system in place already, in ADDITION to the formative/summative resources available through CAASPP. The report explains in very understandable language the need to understand these 3rd party systems and the need to provide more integration resources to get data moving back and forth between systems. I also provided the investigative team with a list of known California assessment system providers. They incorporated that information into a survey (pictured above) which was distributed to school-site CAASPP coordinators (orange) and District CAASPP coordinators (blue). Though not a representative sample for state-wide assessment system adoption, it was interesting to see the results. Is the somewhat large discrepancies between what the schools are doing and what the districts are doing have any significance? Table source: http://www.cde.ca.gov/ta/tg/ca/caaspprptstudies.asp (Pages 45/46). This report includes results of our two 2016 studies: the CAASPP Smarter Balanced Interim Assessment Administration Study and the Access to Designated Supports and Accommodations Study. Many thanks to the representatives of Corona-Norco Unified, Fresno County Office of Education, Greenfield Union, Learning for Life Charter, Los Angeles Unified, Oakland Unified, Poway Unified, Salinas Union High, San Diego Unified, Tulare City, Victor Valley Union High, and Westchester Secondary Charter, who participated in one or both of these studies! Hooray Westchester Charter for helping to advance the assessment system conversation. Woot-woot! The California Department of Education (CDE) is pleased to announce the launch of two new assessments for pilot testing, the California Science Test (CAST) and the California Alternate Assessment (CAA) for Science. These assessments will be available once your local educational agency (LEA) testing windows opens. Please note that students and schools will not receive results from the CAST and CAA for Science pilot tests. I encourage you to use this opportunity to begin the transition to the California Next Generation Science Standards (CA NGSS). The items on the CAST pilot test reflect the new, innovative approach to teaching science called for in the CA NGSS. Item types used for the CAST pilot range from traditional multiple-choice item types to items that utilize simulations and other technology-enabled item types. The CAST is designed to encompass items that assess at least two of the three learning dimensions in the CA NGSS: Disciplinary Core Ideas; Science and Engineering Practices; and Crosscutting Concepts. The CAST practice test Online Practice and Training Test Portal contains sample items for grades five, eight, and high school and is available on the California Assessment of Student Performance and Progress Portal. 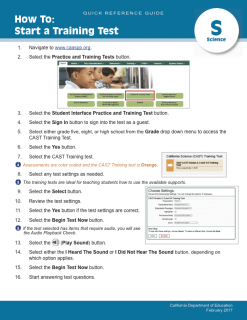 The Quick Reference Guide: How to Start a Training Test for Science is a resource for educators and parents on how to access the CAST training test and is available on the CDE CAST Web page. The CAA for Science pilot test consists of an embedded performance task, that consists of a collection of activities and questions that can be administered after related concepts are introduced and taught to the students. The administration of the embedded performance task following instruction allows students to demonstrate what they know and can do in a less burdensome environment and minimizes the gap between instruction and assessment. A Training Sample of an Embedded Performance Task is posted on the CAASPP portal. Building the CAST and the CAA for Science tests are a learning process. We are continually seeking new ways to improve our items as California continues to implement the CA NGSS to ensure that the CAST and the CAA for Science best measures what students know and can do. The CDE continues to engage stakeholders, teachers, and science and assessment experts for input on this journey of creating a quality assessment that best reflects the richness of the CA NGSS. Because the science pilot tests serve as a learning process, we encourage educators and students to complete the surveys at the end of the pilots to provide feedback that will be used to refine the science assessments. •	Quick Reference Guide: How to Start a CAST pilot test If you have any questions regarding this information, please contact the CAASPP Office by phone at 916-445-8765 or by e-mail at . The Smarter Balanced Summative assessments are now available for administration within your local educational agency’s (LEA’s) selected testing window. The interim assessments also can be administered at this time. The CAA training tests for English language arts/literacy and mathematics have been updated with new item types. Users with CAASPP system access cannot access the ELPAC version of TOMS unless they have been assigned that access, and vice versa. User credentials—username and password—will be the same for users who have been granted access on behalf of both testing programs. CAASPP users still access the appropriate systems via the buttons and links on http://www.caaspp.org/ . System e-mails with information for users about usernames and passwords will now include a sender address of . To ensure users receive these e-mails, please ask your technical staff to white-list this new e-mail address. The Test Administrator Interface now includes additional color coding intended to help LEAs visually confirm that the appropriate assessment is selected for student testing. Additional information about color coding is available in the CAASPP Online Test Administration Manual . A short sample video has been added to the audio check in the student testing interface. If a student does not hear the audio chime and/or see the video animation, he or she will be presented with an opportunity to test these features work prior to administering the assessments. The updated check is available for the summative, interim, practice, and training tests. The Desmos Calculator has replaced the previous online calculator in the test delivery system. To learn more about the benefits of the Demos Calculator and how it differs from the previous online calculator, view the New Online Calculator for the CAASPP System PowerPoint presentation. Focusing on the CAASPP System, including the Smarter Balanced assessments—a major component of CAASPP—and the California Alternate Assessments and science assessments. In addition, the recommendations on the use of scratch paper (non-embedded universal tool) now include the use of a whiteboard and marker as well as low-tech assistive devices for taking notes. Internet access must be disabled on assistive technology devices and, where appropriate, separate setting may be used to maintain a secure testing environment. California Code of Regulations, Title 5, Section 863 requires that local educational agencies (LEAs) mail the Student Score Reports to parents or guardians within 20 working days after they receive the printed reports from Educational Testing Service. The exception to this requirement applies when an LEA receives the printed reports after the last day of instruction, in which case it must mail the reports within the first 20 working days of the next school year. Schools must maintain each student's results (print and/or electronic) in the student's permanent records. Summer Hand Scoring Workshops Online Registration Coming Soon! Educational Testing Service (ETS) will conduct one-day CAASPP Summer Hand Scoring Workshops in July and August. These workshops will train educators to score constructed-response items and performance tasks for English language arts/literacy and mathematics and to prepare students for the Smarter Balanced Summative Assessments. Section 851.5(c) clarifies eligibility for the Standards-based Tests in Spanish as a student in one of grades three through eight and grade eleven (1) whose primary language is Spanish and who is receiving instruction in Spanish; or (2) who is enrolled in a dual language immersion program that includes Spanish; or (3) who is a recently arrived English learner and whose primary language is Spanish. As millions of California students take tests aligned with the Common Core standards for the second year, results are coming in more quickly than they did the first time around, a change that could help educators make better use of the tests to help guide classroom instruction. One of the major selling points of the Smarter Balanced tests was that schools would get the results much more quickly than they did under the old California Standards Tests, and that the scores would be more useful in informing how students were taught. It is a non-embedded accommodation available to students in grades four and above who have an individualized education program or Section 504 plan. For students in grade three who have a documented need, it must be requested as an unlisted resource in TOMS. The use of the multiplication table in grade three can be found in Matrix One: Universal Tools, Designated Supports, and Accommodations for the California Assessment of Student Performance and Progress for 2015–16 (PDF), "Unlisted Resources" (pages 8 and 9), as a pre-identified unlisted resources that is known to change the construct. Unlisted resources that change the construct are not valid for accountability calculations. Students must complete both the California Alternate Assessment (CAA) for English language arts and the CAA for mathematics. If a student does not orient during or respond to the first four questions of the first subject area they engage, the test examiner (TE) may end the test as instructed in the Directions for Administration (DFAs). The TE still must administer the subsequent subject-area assessment, and if the student does not orient or respond to the first four questions of the following assessment, the TE may end the test as instructed by the DFAs. Continue your vigilance regarding security breaches involving the exposure of secure materials and ensure that all test administration environments are secure. The California Department of Education (CDE) is monitoring social media sites to make certain that CAASPP testing content has not been posted. Remember to submit your Security and Test Administration Incident Reporting System (STAIRS) form and/or appeals requests as soon as possible and to follow-up on all requests to ensure that their processing is complete prior to the end of the testing window. The Spanish version of the video “Understanding the CAASPP Student Score Report” is now available on the CDE CAASPP Student Score Report Information Web page. This eight-minute video highlights the new features on the score report, using samples of the report in Spanish. The CDE has seen an increase in the number of testing issues reported as “Other.” Before selecting the testing issue “Other,” please ensure that your test security incident does not fall into a listed test issue category by referring to the STAIRS—Applicable Testing Issues chart . Note that selecting the category “Other” when a listed issue actually applies may cause a significant delayin the processing of your report. Further explanation of testing incidents can be found in the CAASPP Security Incidents and Appeals Procedure Guide . When contacting the California Technical Assistance Center to report a universal tool, designated support, or accommodation that does not seem to be functioning correctly, please provide the test session ID number and the student’s Statewide Student Identifier to allow technical staff to investigate the issue in a timely manner. This Webcast is open to all school and district staff—please notify curriculum instruction leaders, professional development leaders, and/or LEA representatives who would disseminate the information to other teachers in your LEA. No preregistration or logon account is required. The Webcast and related materials will later be archived and available in the “Webcast Archives” section on the CAASPP Current Administration of the CAASPP System Tests Training Videos and Resources Web page . The CAASPP independent evaluator, Human Resources Research Organization (HumRRO), is continuing to collect responses to its statewide survey, which is the final stage of a study exploring local experiences with the Smarter Balanced Interim Assessments. The survey invites primary LEA CAASPP coordinators and a random sample of CAASPP school site coordinators and test administrators to answer questions about the usage of, experiences with, and utility of the interim assessments. Today, HumRRO will be e-mailing reminders to those selected for the survey who have not yet submitted their completed responses. The survey will remain open through May 27. We encourage selected LEA staff to respond, even if they have not completed any interim testing, and thank all respondents advance for providing insight as to the benefits and challenges of the Smarter Balanced Interim Assessments. Carol Kohn is May’s featured State Network of Educators (SNE) member. Carol has worked in the education profession for more than 45 years. A retired educator, she worked for the Bakersfield City School District, where she served as a teacher in the elementary grades for 29 years. Before that, she taught at California State University, Bakersfield, for 17 years. Carol joined the SNE in 2013, during the beginning stages of the Smarter Balanced Digital Library. She feels that the SNE provides an effective way to work with educators throughout the state. As a member of the SNE, Carol has completed more than 40 reviews of resources and contributed four of her own. One of her favorites, Counting Coins to One Dollar Checklist , provides teachers with a list of coin counting sub-skills used to inventory student understanding and a list of activities that can be used to reinforce these skills, especially with struggling students. Also included in the lesson is a checklist of activities that educators can give to parents to help the students at home. To learn more about Carol and other members of the State Network of Educators, please visit the CDE Meet an SNE Member Web page!